Real Name: Trunks Briefs, Son of Vegeta II. Resources: Am(50) in his own timeline, Rm(30) with the Z-Team. Weight: 175LBS. in normal state, 275LBS. when shifting. Talents: Martial Arts B & E (Saiyan Shotokan, American Boxing, Tae Kwon Do), D (Tai Chi), Tumbling, Acrobatics, Streetsmarts, Electronics, Physics, Engineering, Repair/Tinkering, Weapon Specialist (Tai Chi Sword), Pilot (air). Contacts: An alternate timeline of Earth-Z, X-Men (Hero Group), Z-Team (Rm Resources, Hero Group), Bulma Briefs (from his own timeline, CEO of Capsule Corp., Am Resources), Gohan (from his own timelne, Deceased), Avengers(Hero Group). Body Resistance: See Saiyans. In(40). Kinetic Control: Mn(75). Unusual for any Saiyan, Trunks has shown the potential to develop psionic abilities. He is able to create a kinetic pulse field which simulates Telekinesis and Kinetic Bolt at the same time at Mn(75) rank within a 100' range radius. By using the kinetic pulse field, Trunks can add 30(60 if flaring) points to any slugfest damage he causes (including the damage from using his Chi-Sword) or reduce a slugfest attack used against him by 30(60 if flaring) points. This is due to the fact that he can now magnify his own kinetic energy and dampen kinetic energy used against him. This includes force attacks. He must make a Yellow Psyche FEAT to use this. By using the kinetic pulse field, Trunks can reduce the intensity of energy attacks used directly against him by -2CS(-3CS if flaring). He must make a Green FEAT to use this (This is why it was so difficult for 17 and 18's energy blasts and Frieza's Anti-matter sphere to damage him). By making a Green Psyche FEAT, Trunks can harness the latent kinetic energy within his range of control to unleash kinetic bolts of In(40)(Mn(75) if flaring) intensity and range. By making a Yellow Psyche FEAT while flaring, Trunks can kinetically strengthen the material of his sword boosting its Material Strength to Am(50), it will still do only 30 points of edged damage. He used this technique to kill Frieza. By making a Red Psyche FEAT while flaring, Trunks can focus all the latent kinetic energy within his range of control into one punch which can either do Mn(75) blunt or edged damage. Energy Conversion: Through the training he had with the Z-Team, Trunks has learned to convert the latent kinetic energy within his range radius into 1 plasma blast (75 points of force, 40 of electricity, light, heat each) of Mn(75) intensity and range (Un(100) force, 50 for the others if flaring). By making a yellow Power FEAT on his Kinetic Control, Trunks can boost his conversion ability to SX (SY if flaring) for 1-5 turns, after which his kinetic powers are at -3CS and cannot be increased through flaring. He used this to kill the android known as (imperfect)Cell. Power Detection: By training with the other members of the Z-Team, Trunks has developed this power at Am(50) rank and range. Unfortunately, it only detects organic life. Resistance to Power Detection: Through following his father's training regimen, Trunks has developed the ability to psionicly mask his power. This means that powers such as Power, Life, Energy, and Mutant Detection are at -4CS to track him. When Frieza(Cyborg version) tried to scan Trunks with his built-in scanner that has Am(50) Power Detection. Its intensity was lowered to Gd(10) rank when he scanned Trunks. To Frieza, Trunks showed up as a Normal Human. True Flight: Am(50). By making a yellow power FEAT, Trunks can combine his hyperspeed with his flight to travel for 1-5 turns at Mn(70) air speed. Ability Shift: Through training with Vegeta(Earth-Z's version) in the hyperbolic time chamber, Trunks has learned to shift the majority of his energies into brute strength. He can only use this while flaring. The shift boosts his strength to Un(100) for 1-5 turns but does not have the downsides of flaring. Instead, his Health does not change, Fighting, Agility, Reason, Intuition, and Psyche are -1CS for the shift's duration. His Kinetic, Hyperspeed, and Flight powers suffer a -3CS reduction for the duration. Weakness:See Saiyans. Being only Half-Saiyan, Trunks is +4CS to resist his genetic instincts. It is unknown if Trunks was born with or without a tail. Perhaps his parents had his tail surgically removed to make him stronger. As a result, he lost his ability to transform into an Uzaru. Note: Like his father, Trunks is a Super Saiyan. He is a member of the Saiyan Royalty. He is also the last crowned Prince of all Saiyans in his own timeline. Trunks is not opposed to taking lives to ensure the survival of his people or teammates and will not hesitate to slay those he knows to be truly evil. Because of this he suffers only 1/2 total karma loss when voluntarily killing. Trunks was one of the last surviving members of the Z-Team in his timeline. The rest were wiped out by killer androids. 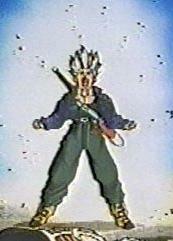 Trunks suffered his greatest trauma when his mentor, Gohan, was killed by the androids. Enraged, the teen's latent mutant powers surfaced and he then became a Super Saiyan. After 2 years of fighting the androids alone, Trunks and his mother Bulma thought up a plan to end the nightmare that was their future. Bulma built a time machine that would take Trunks back in time 4 years before the activation of the androids. The teen then traveled to the past. Upon arriving at the preset temporal coordinates, Trunks battled Frieza and King Cold destroying the Planet Trade's flagship and forces on Earth. After introducing himself to the Z-Team, Trunks told them that Goku would arrive shortly from space. Once Goku arrived, Trunks explained to the Z-Team leader what would take place in the future. He then handed the Saiyan a vaccine for a heart virus that had killed Goku in his alternate future. The teen then leaves for parts unknown. (It is later revealed that his attempt to get back to his own timeline led him to cross paths with the X-Men. He helped them in their battles with the Sentinels.) Trunks reappears on and off to help the Z-Team in their battles with Androids 13, 14, and 15, as well as Hatchyack. Trunks returns to the Z-Team 3 years later only to find that Goku has fallen ill with the heart virus and that Android 20 is really Dr. Gero. Trunks and the rest of the Z-Team rush to stop the scientist from activating Androids 17 and 18, but fail. The androids beat the team within an inch of their lives. Hours later, a recovered Trunks and Krillin fly off in search of Dr. Gero's lab. It is here that they learn of the android knwon as Cell. Days later, Goku recovers from the virus and tells Vegeta and Trunks to train in the Hyperbolic Time Chamber on Kami's Lookout. It is here that Trunks masters his Saiyan powers. He later finds himself fighting first Vegeta then a perfect Cell. As a result of the battle, Cell spares Trunks life to announce the Cell Games. Shortly after, Trunks aids the Z-Team in their battle with Broli. 11 days later the Cell Games begin. Trunks is killed by an energy beam from Cell only to be ressurected by the Eternal Dragon of Earth. After Goku's funeral, the teen leaves in his time capsule to return to his own time. A year later, Trunks returns in time to help the Z-Team defeat Bojack and the rest of the renegade Kais. He then returns to his own time-line never to be seen again. It is doubtful that Earth-Z Prime's version of Trunks will ever be as powerful as the "future" one. If so, the young half-Saiyan has the potential to be the most powerful fighter on Earth and maybe even the universe.